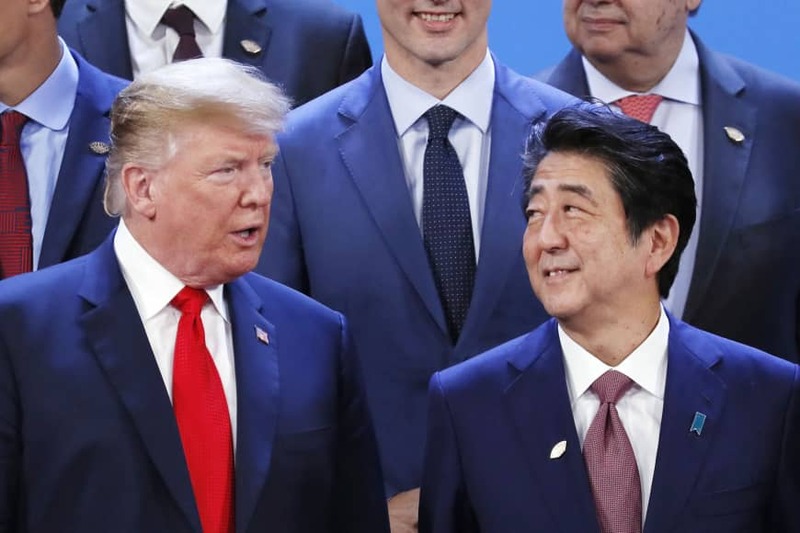 On Sept. 26 in New York, Prime Minister Shinzo Abe was facing reporters at a joint news conference with U.S. President Donald Trump when Trump cracked a joke that in fact sounded like a veiled threat. “We’ve agreed today to start trade negotiations between the United States and Japan,” Trump proudly said after a 75-minute meeting with Abe on the sidelines of the United Nations General Assembly. “Japan was unwilling to do, and now they are willing to do so. We’re very happy about that, and I’m sure that we’ll come to a satisfactory conclusion. And if we don’t, oh …,” Trump said, looking into Abe’s eyes. Trump’s gesture drew laughter from the reporters and an awkward smile from Abe. But the prime minister then briefly put on a serious look of his own as Trump chuckled in front of the cameras. It was not a laughing matter for Abe. It was the moment when Trump declared he had finally forced Abe to agree on holding bilateral trade talks, something Tokyo had long refused to accept. The free trade talks are expected to be launched soon as more than 90 days have passed since the Trump administration notified Congress of its intention to enter trade negotiations with Japan. The 90-day moratorium for the White House is legally required under U.S. trade law. As the Trump administration enters its third year Sunday, Japan-based experts recently interviewed by The Japan Times believe the upcoming talks are likely to be much tougher for Tokyo than those held since Trump’s inauguration on Jan. 20, 2017. The planned talks also symbolize significant changes that the Japan-U.S. relationship has undergone over the past year, they said. In his third year in the Oval Office, Trump is expected to suffer greatly from a divided Congress after the Democrats won a majority in the House of Representatives in the fall midterm elections. This is likely to prompt the U.S. leader to take a much tougher stance on trade issues in a bid to achieve something he can show his supporters before the U.S. presidential election in 2020, the experts said. “It’d be almost hopeless for Trump to attempt to get a major bill passed” through a divided Congress, said Yasushi Watanabe, a professor at Keio University in Tokyo and noted expert on American studies. “I think he has no choice but to try to find a way out in diplomacy and trade talks, where he can use relatively stronger power” than when dealing with domestic affairs, he said. In fact, there are many reasons for Tokyo to worry about Trump’s third year. For one thing, several key advisers who attached much importance to America’s allies and reportedly tried to persuade him not to wage a trade war, were either fired or quit the administration. Such ex-aides include Defense Secretary Jim Mattis, national security adviser H.R. McMaster, Secretary of State Rex Tillerson and top economic adviser Gary Cohn. “One core belief I have always held is that our strength as a nation is inextricably linked to the strength of our unique and comprehensive system of alliances and partnerships,” Mattis wrote in his resignation letter to the president, dated Dec. 20. “While the U.S. remains the indispensable nation in the free world, we cannot protect our interests or serve that role effectively without maintaining strong alliances and showing respect to those allies,” he wrote. “Mattis is a highly respected man. I wonder if Trump can find such a great person again,” lamented a senior official at the﻿﻿ Foreign Ministry in Tokyo. Trump’s approval rating stood at 37 percent in a Gallup poll on U.S. voters conducted between Jan. 2 and 10, with the same poll showing 88 percent of Republican voters approved of Trump’s performance as president. The latter figure suggests he still has rock-solid support from his core followers two years after inauguration, said Kazuhiro Maeshima, a professor at Tokyo’s Sophia University and an expert on American politics. He also said the poll results indicate there is a good chance of Trump winning re-election in 2020, in particular because of the lack of popular Democrats who can compete with him. “None of the Democrats who are now considered potential candidates (for the 2020 vote) would be able to beat Trump,” Maeshima said. “So Japan needs to think about another six years of Trump,” he added. In the meantime, both Watanabe and Maeshima agree that one factor that could hurt Trump’s re-election bid is the alleged Russian intervention in the 2016 election. The findings of special counsel Robert Mueller, who is investigating the Russia scandal, are expected to be publicized soon. If Trump’s campaign team is found to have colluded with Russia or other serious scandals emerge, Republican lawmakers may turn their backs on him and consider finding a powerful rival to run against Trump in 2020, Watanabe said. 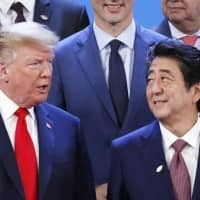 Yorizumi Watanabe, another Keio University professor and an expert on trade negotiations, also believes Trump could toughen his stance against Japan, as he will face difficult domestic situations this year and will have an eye toward trying to win re-election in 2020. “It’s clear Trump is aiming to get re-elected. So he is under much pressure to achieve something” that would appeal to his supporters, Watanabe said. “So I think he is likely to take a confrontational stance against countries with trade surpluses with the U.S.,” he said. But he also added that Trump places top priority on U.S. competition with China, Canada, Mexico and Europe. Compared with those countries, Japan is relatively low on his priority list, he pointed out. Abe’s good relationship with Trump may also be a plus for Japan, Watanabe noted. At the same time, he warned that Trump and many other U.S. political leaders are now deeply concerned that the U.S. may be losing its technological advantage over China. The tariff war may simmer over the short term, but the struggle against China to maintain economic superiority and technological hegemony will continue over the long term, Watanabe said. The trade war could strengthen the trend toward protectionism and damage Japan’s supply chain networks in China and Southeast Asia, he said. Thus Tokyo will try to keep pushing multilateral trade frameworks to promote free trade and eventually try to have Washington participate in them, Watanabe said.